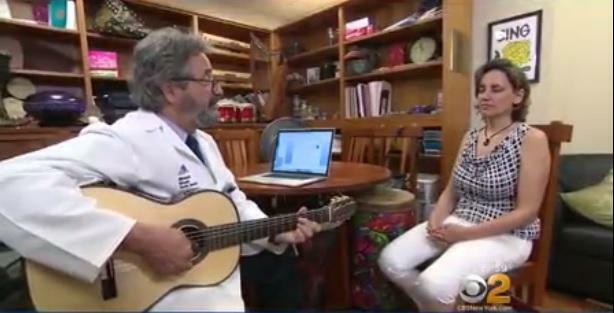 NEW YORK -- A hospital in Manhattan is using music therapy to help cancer patients stay positive and relaxed before and during treatment. After a frightening breast cancer diagnosis at 43 years old, Julia Newmark was overwhelmed with anxiety and suffered from insomnia. She turned to music therapy during radiation for relief. With a young daughter at home, the fear of not surviving was debilitating. "You worry a lot about the future, you can't stop your thoughts, they start to escalate," Newmark said. "He taught me how to relax while I was having the music therapy and also to remember those techniques when I was home." In the first study of its kind in a hard science journal, Mount Sinai Beth Israel music therapy coordinator Andrew Rosetti researched the benefits of music therapy for cancer patients. Asked how stressful it is for patients when they come to the radiation room, Rosetti responded by saying, "For many patients (it's) very stressful. It uses music and verbal processing to lower anxiety and to lower distress." From classical to hard rock, they personalize the playlist for each patient. They found it worked so well before and during treatment, patients saw their stress and anxiety drop by at least 20 percent. Today, Newmark is cancer-free but continues the therapy once a week for relaxation. "It helped me so much through one of the worst moments in my life that now it's helping me with other important aspects of what I want to do," she said.